The painful and horrifying saga that unfolded over several days in September 1972 during the Munich Olympic Games likely haunts Ankie Spitzer and Ilana Romano every Olympic season, if not every day. On September 5, 1972, their husbands, Andre Spitzer and Yossef Romano, were taken hostage with nine other members of the Israeli Olympic team and slain by Palestinian terrorists in the Olympic Village in Munich — the place that was meant to unite athletes from all over the world, despite borders and politics. Now, nearly 40 years later, the issue of honoring the Munich massacre victims with a moment of silence at the Olympic Games continues to be a contentious one. Last month, leading up to the 2012 Olympic Games in London in July, the IOC again rejected the widows’ request in its response to a letter sent by Deputy Foreign Minister Danny Ayalon on behalf of the two women. Several politicians in the U.S. and the U.K. have also thrown their support behind the moment-of-silence initiative — with the U.S. House Foreign Affairs Committee unanimously passing a resolution supporting the call last week — but to no avail. Yet the IOC was not the only one to reject the idea. In a move that raised quite a few eyebrows, Israel’s representative on the IOC, of all people, came out against the initiative earlier this month. Alex Gilady said a moment of silence would “damage the unity of the Olympic movement” and that he would not want to give “our enemies an opportunity to boycott the games.” His remarks were met with a spate of criticism, but they also revealed cracks in what was thought to be a unified Israeli front in support of the campaign. In his defense, Gilady told me he never opposed the moment-of-silence idea, but rather said it was a matter of poor timing. He also lamented a missed opportunity, explaining that such a measure should have been instituted long ago. “During the Munich games there was a ceremony the day after the massacre,” he said. “Four years later, there was an opportunity to have a memorial in Montreal — that would have been the right time. The Israeli National Olympic Committee asked for it but was not persistent. It was not handled correctly and so it did not become a part of the [opening] ceremony. The first time this issue resurfaced was in 1996 in Atlanta. Ever since then, the widows have been trying to push this, and while I’m very sympathetic to them, the danger this would pose to the unity of the Olympic movement is leading the IOC to reject it,” he said. Deputy Foreign Minister Ayalon, who has become one of the biggest proponents of the “Just One Minute” campaign, dismissed Gilady’s argument, saying a technicality should not be used as an excuse to dismiss the idea. But Ayalon told me he does not buy this argument. Herein lies the real question we — or rather the IOC — should be asking. IOC members should be concerned not with whether having a moment of silence would alienate or repel countries hostile to Israel, but why it would repel them at all. A country needn’t be a friend of Israel to be a foe of terrorism and an opponent of murdering Olympians. Unless these countries condone such action, why would they choose to boycott the premier international sporting event and risk looking like they support the bad guys? 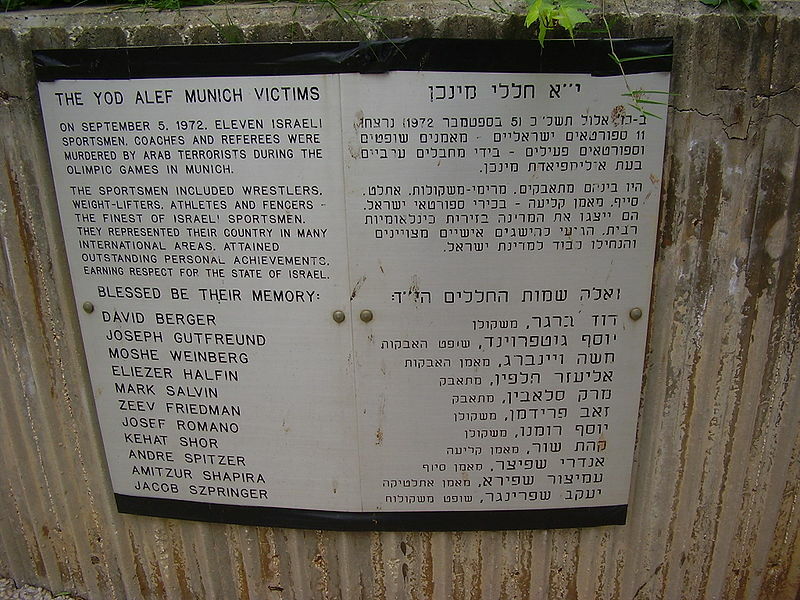 Victims of the Munich massacre may not be honored with a moment of silence this year, but the push for such a commemoration only appears to be growing stronger as more people rally behind the campaign. “We are not going to let up,” Ayalon told me. “I believe we will see more letters, and more resolutions by national parliaments all over the world.” Even Gilady told me he does not believe the idea should be dropped, but that there may be a more appropriate time for it in the future when there is “peace” — whatever he means by that. In light of this pressure, the IOC — concerned with preserving “the unity of the Olympic movement” — will have to consider the repercussions of its refusal, if not this year then at the next games or the ones after that. It will have to ask itself whether holding a moment of silence for athletes murdered in the name of a political cause would truly be divisive. Perhaps it is more divisive not to pause for a moment simply to appease nations who may not support this “unity” in any case?